When was the last time you felt yourself soar? When have you thought about your future and truly felt free to go anywhere, do anything, and completely be yourself? Yet, at our very finger tips is a power that can bring us a sense of awe and wonder at how it truly is possible to be free, fulfilled, and living the life of our dreams. It's amazing to think that we already have the ability to tap into this power even though it's so much bigger than us. It is a power that forms the very basis of the Universe. 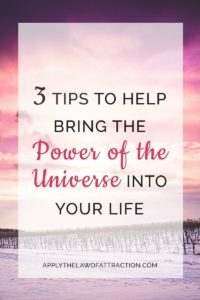 Here are 3 tips to help you bring this power of the Universe into your life. When your life is troubled and you feel like everything is falling apart, know that you are making room for something even better to come in to take its place. As you shift your vibration, things that may have been in your life previously are no longer a match for you. They are a product of old thoughts. You might find that people leave your life, appliances break, trips get cancelled…sometimes everything that could go wrong seems to go wrong at once. Instead of seeing your life as falling apart, see everything as falling together – coming into alignment with the new you, bringing you even greater gifts. Trillions of dollars pass between satellites in space daily. A hippo can open its mouth wide enough to fit a four foot tall child inside. Your eyes are the same size from birth, but your nose and ears never stop growing. If you started with $0.01 and doubled your money daily, it would take 27 days to become a millionaire. If you were to remove all of the empty space from the atoms that make up every person on Earth, the entire world population could fit into an apple. There are so many fascinating things about the world we live in. We never think about how complex the Universe is or how everything works together. That's why it's so important to be grateful for your life and everything in it. You don't have to understand how everything works. Simply be grateful that it does. You are the most important person. You have control over your happiness, your life, your future. You get to choose how successful you will be. You get to choose how you will live your life. You get to choose to do what makes you happy. As you do so, the Universe will provide you guidance along the way and opportunities to help you manifest your dreams. Thank you. Thank you. Thank you for this wonderful tips. I’m really glad to subscribe to this site.thank you very much I would love to get more and more tips.